My little guy goes through phases as I am sure most kids do. A couple of months ago he was really into Army men, before that it was race cars and before that it was Star Wars. He cycles through these phases which is nice since we will just pull out all the toys and activities that he had the last time he went through that phase. About a month ago he began his dinosaur phase. It doesn’t look like he is leaving this phase any time soon. It all started with a new app he found for the iPad. Its a game very similar to the popular Clash of Clans game only instead of troops, you have dinosaurs. He plays it a little bit every day. When he goes through these phases I end up learning a lot about the subject. He loves to share and since we are home together all day, he shares his information with me. While I may not know what all the dinosaurs are, I do know that I can use this new obsession to my advantage. 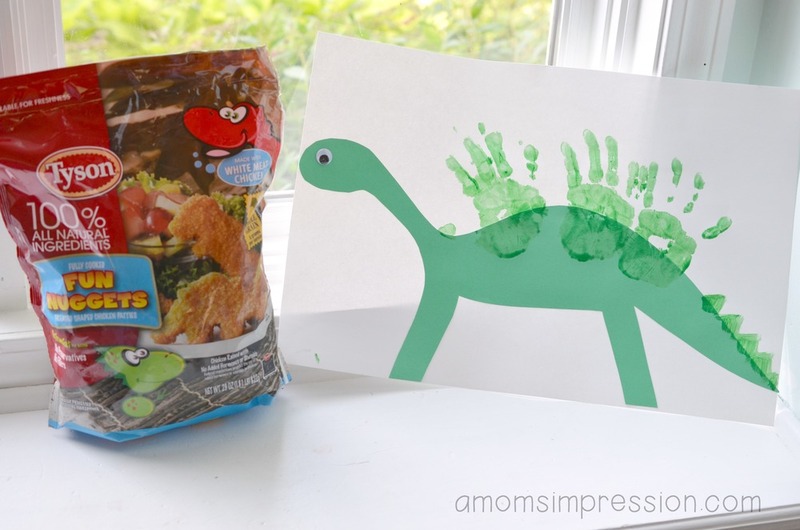 When I found the dinosaur shaped Tyson® Fun Nuggets at Kroger, I knew that I might be able to make eating his vegetables a little more fun! 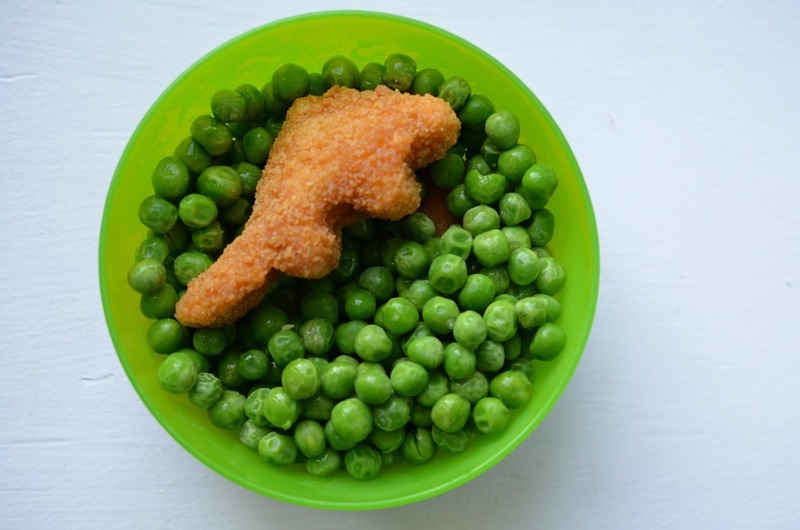 For dinner that night, Jonah became a paleontologist, he had to dig up his dinosaurs for dinner. Sometimes this mommy has to get extra creative to make sure Jonah eats his vegetables. If you aren’t a follower of my blog you may not know that Jonah has had struggles eating his entire life. He went through food therapy and now I am happy to tell you that he is eating pretty much like a normal 7 year-old. He has a ways to go in order to catch back up with his peers in his height and weight, but we are on the right track. That being said, he doesn’t always like to eat his vegetables and that is where creativity comes into play. He loves it when mom gets playful with his food. He loosens up and will usually at least try it. 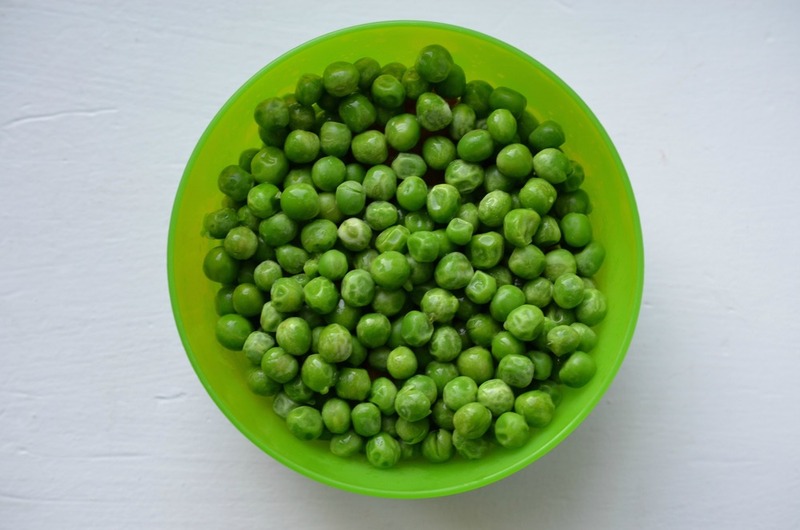 For this dinner, I made him a few Tyson® Fun Nuggets and covered them with peas. He had to eat his way through to “discover” the dinosaurs on the bottom. He loved it. While I wish I could say he ate all those peas, he didn’t, but he did eat quite a few and WAY more than he normally does. I call it a Mom Win! 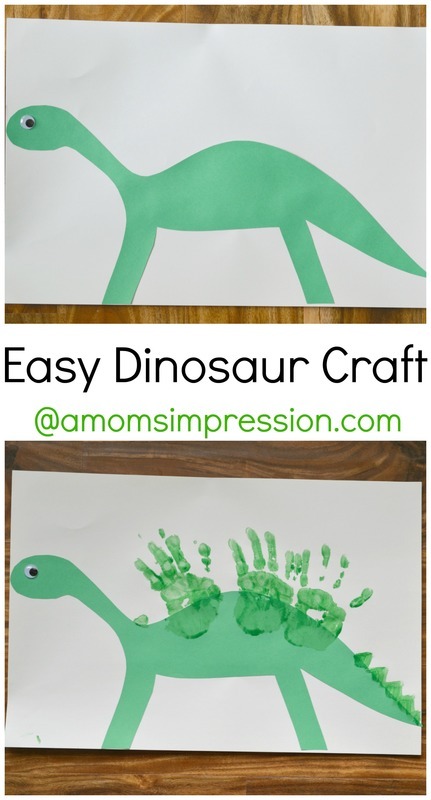 After dinner I thought it would be fun to do an easy dinosaur craft. 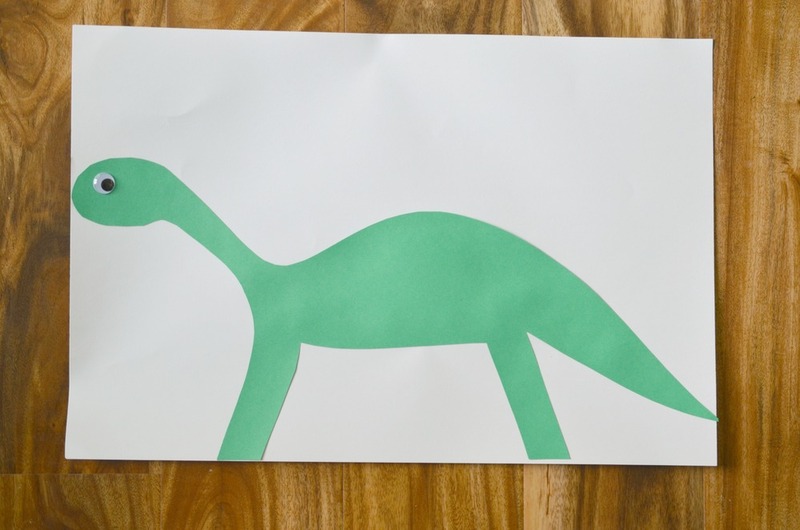 I used to make these simple dinosaurs in my kindergarten class years ago. We would make them different colors so that they turned our classroom into a colorful dinosaur habitat. Jonah prefers a green dinosaur so we found some white and green construction paper, green paint, and a squiggly eye that we had in the craft room. 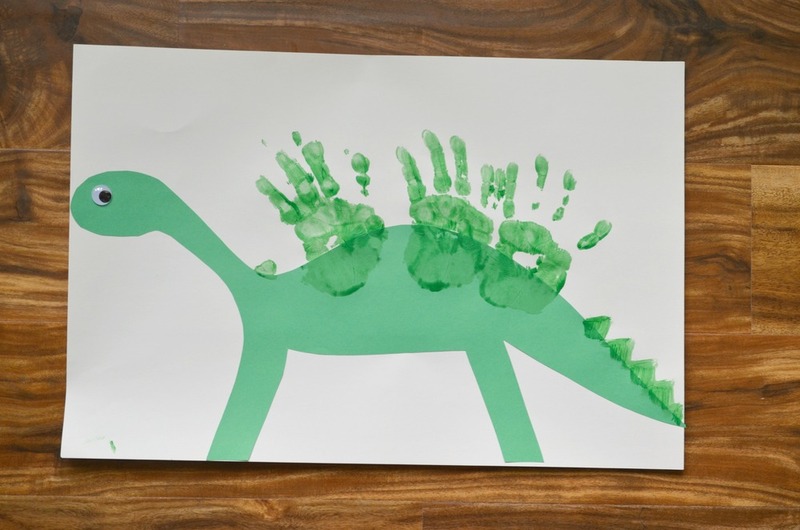 I cut out the dinosaur out of the green paper and Jonah glued it onto the white piece and added the squiggly eye. Next, we took the paint and brushed Jonah’s had with the green paint. He put his hands down the dinosaurs back to make spikes. It is an adorable craft that I will treasure for years to come when his little hands aren’t so little anymore. Its simple, memorable, and fun! Life’s an Adventure and Tyson Foods, Inc. is here to help you on your own adventure this spring and summer! Visit the Tyson Foods, Inc. website and embark on 4 unique adventures. Unlock each adventure of your choosing with one easy question (one per day). When you unlock the adventure you will see some fun downloads like games, activity sheets and coloring pages that you can do with your kids. Be sure to grab some Tyson® Fun Nuggets the next time you are shopping at Kroger.